The handbag as we know it did not spring into existence until late in the 19th century when the term “handbag” was first coined, but it was already in the 18th century that the bagscarried by ladies contained items of which many are still indispensable today. Among the things found in a ladies bag were rouge, face powder, fans, scent bottles and visiting cards. But let us start at the beginning: Handbags went a long way before they took on the shape that we are used to seeing today. From 1500BC to 550BC Assyrians and Babylonians used richly embroidered handbags for religious ceremonies and the ancient Persians pinned small pouches to their golden girdles that contained money. Egyptian hieroglyphs depict pouches carried around the waist. Peasants in rural societies had bags in which they would carry seeds for sowing, African priests had bags with beads on them – and there is a painting from 480BC in the possession of Ashmolean Museum in Oxford, England, that depicts a boy holding a “purse” filled with knucklebones, which were considered to be a token of seduction. But the first time Bags were mentioned in written literature was much later before the 14th century. Men would carry little purses containing scented oranges, flint and money. They would carry this bag on the back of their girdle and thives would steal them by cutting the purse off. This is where the term “cutpurse” originates as used by Shakespeare in Hamlet. In the 14th century these became more ornamental, and were worn by men and women alike. The ornamental decoration was usually gold and embroidery and the finesse of the ornamentation showed the social standing of the bearer of the satchel.New brides were often given bags that were illustrated with love stories. In the 15th century women started wearing fashionable, finer dresses and it became popular to wear flat pouches under the skirt attached with a drawstring.At this point we can summarise that up to the early 16th century, purses were worn on belts by both men and women. In the 16th century bags got a more practical role. Simple bags were made from leather and travellers wore large cloth travel-bags that were worn over the shoulder. In the 17th century men stopped carrying “handbags” as there was a lot of pocket-space in the now fashionable breeches. The pocket would be the bags biggest adversery from now on! The women’s “handbags” saw an increase in decorative stitched artwork, as girls were taught stitching and other skills to make them marriage material! The Muff became a popular fashion accessory for both men and women and stayed well into the 19th century. In the 18th century purses at first disappeared and then re-appeared with the new fashion following the French revolution, finding their space in neo-classical fashion due to the delicate clothing with fewer underclothings that the women were now wearing. These bags were called “reticule” and were considered a necessary costume item. 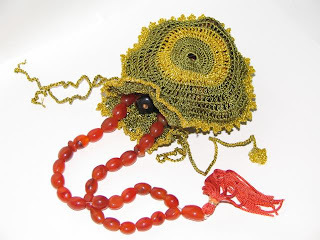 Ladies usually had more than one for the various occasions and as mentioned above, these bags contained items that are still to be found in handbags today, such as rouge, face powder, fans, scent bottles, visiting cards, card cases and smelling salts. Other bags – made to contain cosmetics were the “sabretache” and the so-called “chatelaines”. In the 19th century, as skirts became wider handbags had a tough time and almost disappeared again. Even when dresses grew tighter in the 1880’s until at the turn of the century the “hobble skirt” came into fashion. With this skirt it was impossible to have a pocket!The term “handbag” was used for the first time and then referred to men’s travel bags, by which the fashion of women’s bags was inspired: bags now had several compartments and complicated locks. Also, this was the first time the “satchel” came off the belt and onto the shoulder - it got some handles in the form of long strings and chains. Until now, bags were always expected to match the costume they were worn with, but this changed around 1920, when the handbag became a symbol of independence.In the 1940’s due to WWII there was a shortage of traditional handbag materials such as leather and metal and manufacturers turned to plastic and wood as alternatives. In the 1950’s handbag designers emerged such as Louis Vuitton. Famous designs since then include the Chanel 2.55 bag and the Hermes Birkin bag. Today the boundaries of handbag-makers are virtually non-existant considering the wide range of materials, colours and designs available. Handbags are available in every price-range and popular high-fashion brands often end up having fakes modelled after their bags.